Reduced price - now ridiculously good value for an excellent fun game. It is the 1950s and a shadow has fallen across the Earth! A massive Alien Armada has come from the deepest reaches of space with a single goal... to conquer the planet! But mankind will not be swept away easily. As wave upon wave of alien saucers descend from the heavens to unleash total destruction, Captain Fantastic, Earth's mightiest superhero, rallies humanity's defences. Flying Saucers dogfight with Jet Fighters over the skies of the capitol and heavy Army Tanks roll through the streets to defend against waves of Robotic Soldiers and Tentacled alien fiends. Though these primitive Humans are ripe for defeat, the aliens may be their own worst enemy. Old rivalries flare and ambitions ignite amongst the varied alien races of the armada as they do anything to gain the favour of their Overseer masters, including undermining and betraying one another to ultimately achieve the sole glory in... the Conquest of Planet Earth! Conquest of Planet Earth, The Space Alien Game is a fast-paced game of terrifying alien invaders, futile Human resistance, and 50's Sci-Fi Movie Action. Players each take on the role of a different Alien Race, all part of the same invading armada, but each with their own unique abilities and ambitions. Command waves of Flying Saucers to blast the Human resistance into submission with Death Rays and terrifying weapons of war as they unleash powerful alien technologies upon the Earth (and the other Alien Races if they get in your way). But beware; these pitiful Humans are not defenceless. They will fight to the last to defend their planet, aided by countless platoons of army soldiers, powerful Human Heroes, and their most deadly new weapon, the dreaded Atomic Bomb. Featuring a modular game board, 10 different Alien Races to play (such as the Orzax, masters of technology; or the Venezian Matriarchy; beautiful but deadly spaces amazons), a host of Human Resistance to battle, and four game types - Competitive, Cooperative, Team Game, and Solo Play. 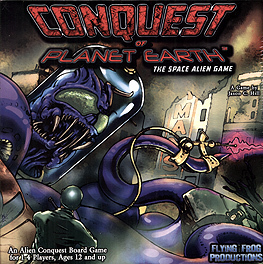 Conquest of Planet Earth is a strategic game of maneuvering, backstabbing, and fantastic battles for alien conquest. An excellent game whose premise is that you are an alien race taking part in the conquest of Earth. There are several races, all with different powers that influence gameplay. The game supports 1-4 players and the play area consists of a central board, plus a board for each player to represent their respective playing areas. The components are of very high quality, and the illustrations are very good. The game has two modes, competitive and co-operative, and the game is sold as a competitive game with each players trying to be the first to gain 8 terror points. This competitive mode is fun, but not compelling. It is as a co-operative game that the game really comes into it's own. Although included as an optional variant the co-op game sees 1-4 players working together to gain a number or terror points before 10 turns have elapsed and humanity develops the technology to repel the Alain forces. It is this race against time that the game does very well which each player trying to gain points but also assist other players by playing cards to benefit them. The co-op game has mechanics that can cause random human forces to appear on previously conquered territory and allows the humane to upgrade their attacks. My recommendation would be to buy this as a co-op experience as it is a really enjoyable co-op game, but in it's default competitive mode it is merely OK. I have played this game several times now, but so far only the competitive version of the game. The components are of a high quality, nice plastic miniatures for the Players and ally pieces, high quality artwork and cardboard tokens all in keeping with the theme of this game. There is a lot going on in this game and it is very easy to overlook a card or ability during your turn. Players represent an alien race trying to take over planet earth, from their landing site players move their pieces, turn over location cards and battle the resistance there. Each location has a number of resistance and Terror points score, players needing to conquest areas to a total score of 8 to win. There are event cards players used to help your own plans or scupper other player\'s plans. There is also Space stuff which is equipment used to aid your invasion. �When you land on a location you strength is the number of alien craft you put in times the strength of your race, plus you and the resistance get a dice roll to add to your total. When you battle for a location you draw a resistance card this determines their strength, if a Hero is drawn you draw another resistance card and total the scores. It is possible to beat overwhelming odds by rolling a 6 which is a crushing victory but if the other side also roll a 6 then it is a tie and you lose an alien and have to either retreat or fight the same resistance for another round. I enjoyed playing this game and it has a Mars Attacks kind of feel to it, but I did feel there was something missing and I wanted more. Having spoken to someone else who has played the game, the co-operative version of the game is more involved and adds extra elements to the game. I will certainly play this again and hopefully try out the co-operative version. For replay ability having different versions of the same game certainly provides plenty of options and is a very neat idea.